Santa Fe, NM, April 25, 2011 – Soulful Presence of Santa Fe and HITIP of Cameroon are proud to announce the first annual “A Taste of Africa.” The fundraising event will be held on Friday, May 13 at El Museo Cultural de Santa Fe at the Railyard, 555 Camino de la Familia, from 5:30-9:30 pm. This will be an entertaining and educational evening for the whole family, with fabulous food provided by the popular and award-winning Jambo Café, along with music, dance performances, drumming, body painting and visual art. Tickets are $15 per person, or $25 for two, students and seniors $10, with children under age 12 free. Live music will be performed by Hakeem and Gasali, West African dance by Shayla, art by Vicki Scott and the Black Art Studio, Jen Klarfeld, Kamajou Tadfor, and Gasali will be displayed, and storytelling will be performed by Nancy King. In addition to the food from Jambo Café, Ceci Tadfor will be providing Pan-African food. A silent auction and raffle will feature African arts and crafts. 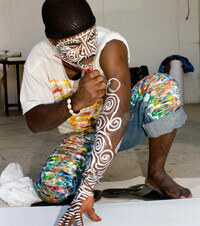 There will also be tribal face painting for the children. Exiled Cameroonian artist, Issa Nyaphaga, will create an original painting in collaboration with local musicians in an exciting live performance that will include body painting and painting on canvas. 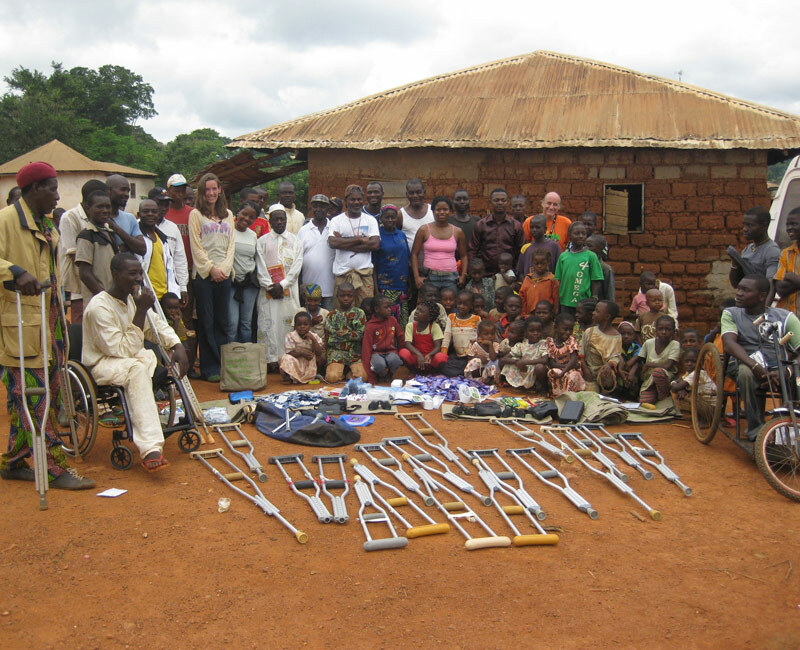 Issa Nyaphaga is gearing up for a trip to Cameroon this summer to deliver wheelchairs, medical equipment and medical aid to improve life for Tikar and Pygmy people with disabilities. “A Taste of Africa” will provide funds for this trip. He will once again team up with Dr. Georges Bwelle, a Cameroonian surgeon, whose Mobile Clinic team provided 415 medical consultations, medication for 900 people and 21 surgeries during his visit last year. This year the medical team will include eight medical students from Drexel University. Advance tickets available at Jambo Cafe, 2010 Cerrillos Rd., Santa Fe. For more information, please call El Museo at 505-992-0591. Donations for the trip are also being accepted directly at the Soulful Presence website. Or send checks payable to Soulful Presence to PO Box 4578, Santa Fe, NM 87502. Nyaphaga, an exiled Cameroonian artist, started HITIP in 2002 after being inspired by a young polio survivor with disabilities in his native country. This led the artist to raise funds to purchase a wheelchair and deliver it to Ibrahim, helping to fulfill the boy's dream of freedom. Soulful Presence was founded by Marcie Davis, a Santa Fe businesswoman and activist who also advocates for people with disabilities in the US and abroad. The two organizations joined forces after Nyaphaga came to Santa Fe for an artist's residency program at the Art Institute. Soulful Presence's mission is to empower underserved populations by creating awareness and advancing policy, research, education, and social action. For more information contact: Jenny Sanborn at 505-795-4453.